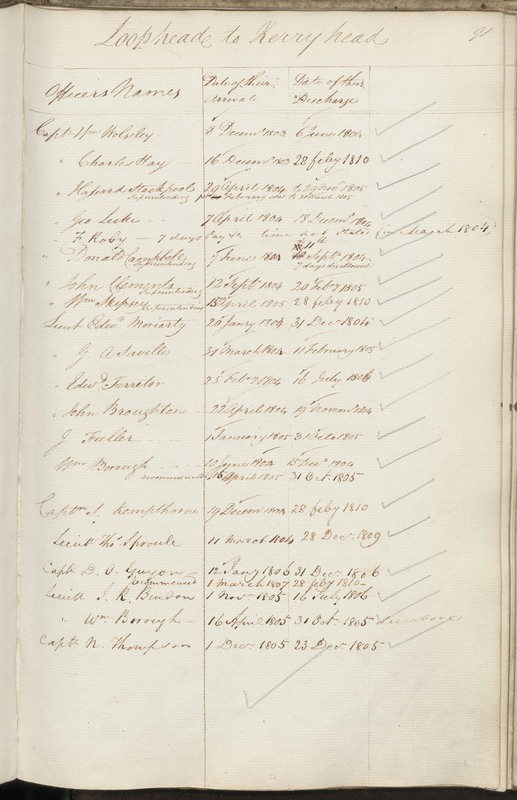 Navy Board: Sea Fencibles Pay Lists, 1798-1810, ADM 28. See contents. List of Districts and Officers, ADM 28/145. See contents. Daniel Guion on p.91. D O Guion letter, 1805. ADM 1/1852/2. D O Guion letter, 1807. ADM 1/1854/205. D O Guion letter, 1810. ADM 1/1857/29. Will of Sara Harnett, 1867. Lloyd v. Pooley, 1874, [NA.UK], Contentious Probate Case Files, Court of Probate, J 121/2388. D O Guion letter, 1810. ADM 1/1857/130. D O Guion letter, 1810. ADM 1/1857/134. 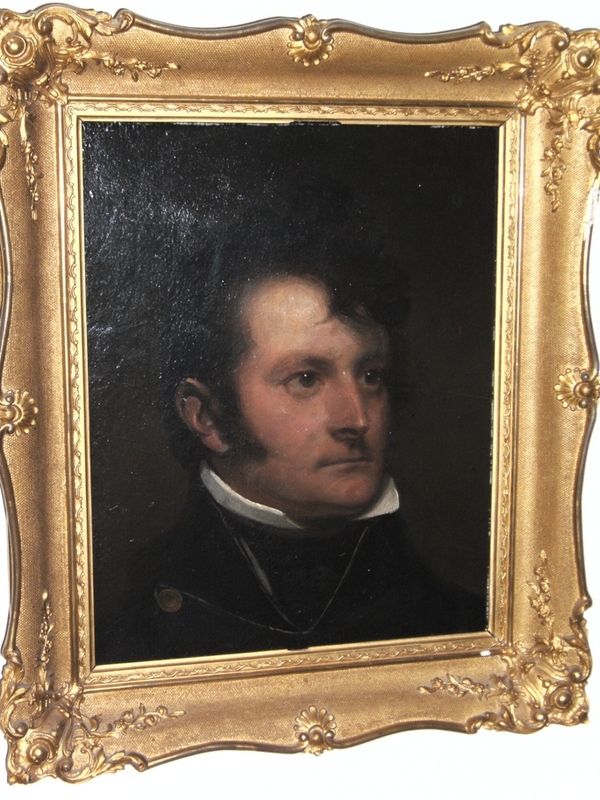 Naval Biographical Database has references for Daniel Oliver Guion, 1794 to 1811. See full size. Image courtesy of Hans Weebers. This portrait is in the family of Capt. Gardiner Guion, not in the family of the heirs of Sara Harnett, so think this portrait is from before Daniel met Sara (before 1809). 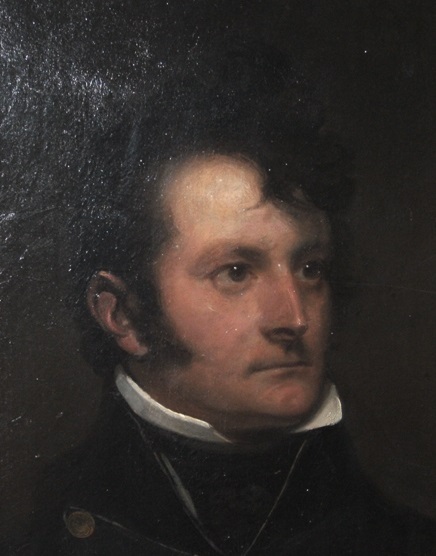 Daniel Oliver Guion, born 20 Apr 1776. Midshipman in 1792. Saw action in the Action of 31 July 1793 off the New Jersey coast. Lieutenant in 1794. 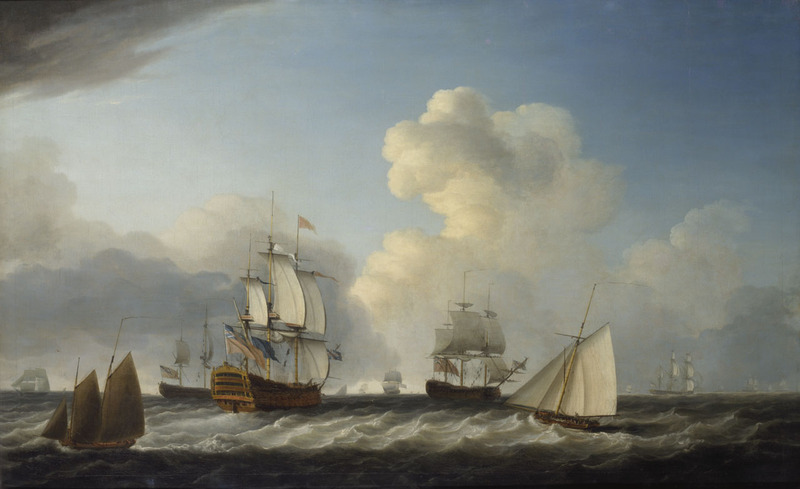 Saw action in the Glorious First of June in the Atlantic in 1794. Commander in 1799. Saw action in the Battle of Abukir in Egypt in 1801. He became a Captain in the Irish Sea Fencibles (naval militia), whose main job was to defend the coast against the constant threat of French invasion. [ADM 1/1852/2] is letter from him in Surrey St, Strand, London, 9 Dec 1805, acknowledging appointment to Sea Fencibles, will proceed to Dublin. [ADM 28/145] says he was Captain in the Irish Sea Fencibles from 12 Jan 1806 to 31 Dec 1806, and 1 Mar 1807 to 28 Feb 1810. [ADM 28/145] says he operated from Loop Head to Kerry Head, covering the mouth of the Shannon (off the coasts of Co.Kerry and Co.Clare). He writes in Apr 1807 [ADM 1/1854/205] from Kilrush, S Co.Clare (on Shannon Estuary) about the Sea Fencibles activity off the W coast of Co.Clare. His headquarters were in Tarbert, Co.Kerry, where Richard Ponsonby was head of Customs 1803-11. He must have met Richard and his brother William Ponsonby, Major in the Kerry Militia (who would have cooperated with the Sea Fencibles). He fell in love with Sara Harnett, William Ponsonby's step-daughter. Daniel mar c.1809 (her age c.16-17, him age c.33) to Sara Harnett [born 1792 or 1793]. 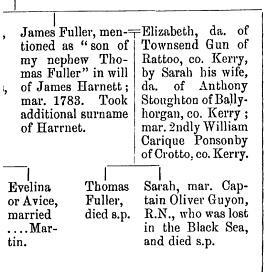 She was the daughter of the deceased James Fuller Harnett, and the step-daughter from a very young age of William Ponsonby of Crotto, Co.Kerry. [Notebook of Alphons Albers] says Daniel met her when he "was cruising off Ireland near the Ponsonby's home" (Crotto). They married in the library of her stepfather's house Crotto. [Notebook of Alphons Albers] says "She was married in her father's library (against her parent's desire who nevertheless consented) and went off with him directly." It was thought she was "disowned" for marrying without consent, but it seems that her uncle William accepted the marriage since Daniel uses Crotto as an address for correspondence in March 1810. The Sea Fencibles were disbanded in 1810. 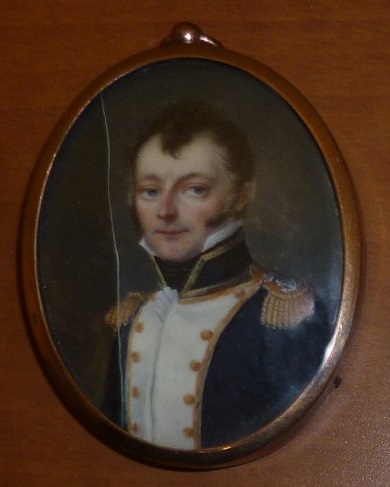 Daniel was dismissed as Commander of the Sea Fencibles on 28 Feb 1810. 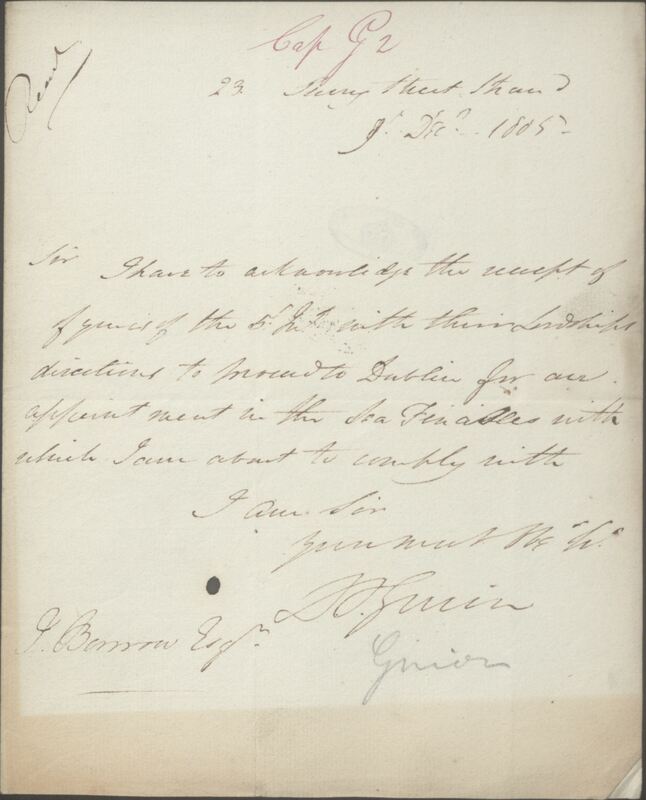 In March 1810 [ADM 1/1857/29] Daniel writes from Crotto to the Admiralty looking for a position: "the reduction of the Sea Fencibles .. leaving me without employment". He took the St George into the Baltic Sea. Coming back, his ship was wrecked off Denmark. He died on Christmas Eve, 24 Dec 1811, age 35 yrs, when his ship the St George was wrecked in a storm off the W coast of Denmark (see map), along with another Royal Navy ship, the Defence. An incredible 1,300 men drowned. Combined it was apparently the worst Royal Navy disaster before WWI. [Notebook of Alphons Albers] says of Sara: "She was only seventeen when he left her on Xmas Eve in the Admiral ship for the Baltic where he was frozen to death". Sara's mother died 1812, leaving her an orphan as well as a widow. Her brother Thomas Fuller Harnett wasted his inheritance, was put in a debtors prison in 1814, became a drug addict, and was hanged for forgery in 1820. Sara is the only relative named as trying to help him. Sara lived at some point at Southampton. She was very educated, and interested in literature. She possibly visited the poet Lord Byron in Italy in 1821-22. She was a great friend of the writer Walter Savage Landor. She is listed in 1861 census at house 5 Rotunda Terrace, Cheltenham, Gloucestershire, age given as 69, widow. She settled in 1866 [according to Robert Burrowes below] in Weston-Super-Mare, Somerset. She stayed in contact with her step-sister Anne Ponsonby (who married Lloyd and died 1866). In her will of 1867 she refers to Anne's son George Ponsonby Lloyd as her nephew. Listed in 1871 census at 1 Glentworth, Weston Super Mare, age given as 78, widow. She died 16 June 1873, Weston-Super-Mare, age given as 80 yrs [London Standard, 12 March 1874]. A witness in the dispute, Fanny Burrowes, said that Sara had "often spoken to me of her nephew Mr. Lloyd (the Plaintiff in this cause) before the time of her making her will. She seemed to have a great objection to him - indeed a perfect horror of him. ... she stated that the reason for this feeling was that she was much attached to her half sister Mrs. Lloyd his mother whose life he had not made happy - she told me he was a dissipated character and given to drink. She also told me that it was not her intention that he should benefit by her will." Fanny Burrowes also said: "I mentioned her nephew every time I called. I asked her if she did not wish to see him. She always said she did not wish to see him. She spoke of him as "that horrid creature"". Fanny's husband Robert Burrowes was also a witness, and said about Sara's relationship with her nephew: "Mrs. Guion expressed herself hurt that none of her family had gone near her". George Ponsonby Lloyd failed to overturn the will. See London Standard, 12 March 1874. See Western Gazette, 20 March 1874. This seems to be Capt. Daniel Guion. Courtesy of Sylvia Goiran and Adair Hobson. Capt. 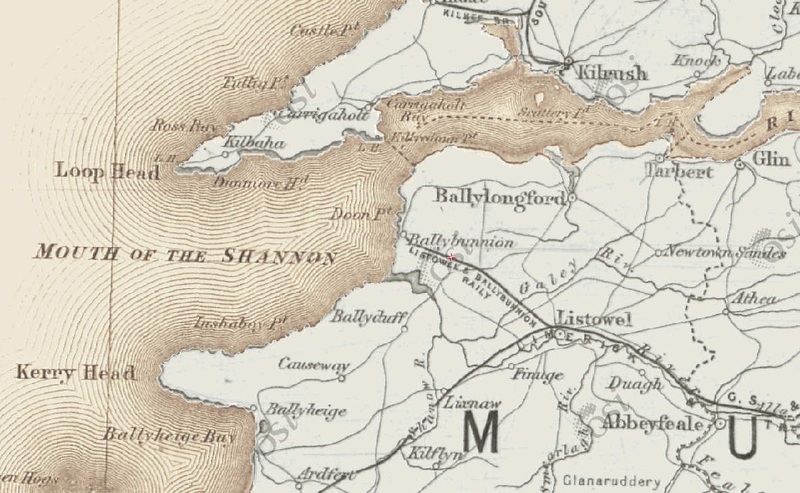 Daniel Guion operated in 1806-10 from Loop Head to Kerry Head, covering the mouth of the Shannon. His headquarters were at Tarbert, where Richard Ponsonby was head of Customs. He met Richard's niece Sara Harnett, who lived with her step-father at Crotto near Kilflyn. Capt. Daniel Guion uses his wife's house Crotto, Co.Kerry, as an address for correspondence in March 1810. The poet Lord Byron lived in Pisa in 1821 to 1822. 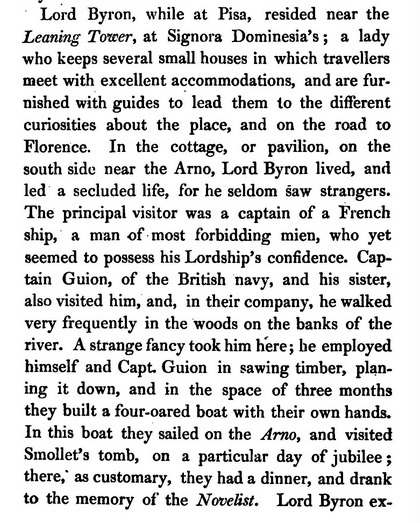 He was visited by "Captain Guion" and "his sister". The only Captain Guion in the navy at this time was Capt. Gardiner Guion, who did indeed serve in the Mediterranean around this time, except he had no sister. Perhaps it is Sara, his sister-in-law. From pp.146-150 of vol.2 of The Life, Writings, Opinions, and Times of Lord Byron (1825). Sara Guion (née Harnett) writes a letter to her nephew George Ponsonby Lloyd in 1866. Letter in the papers of the 1874 dispute. Sara Harnett shown in [Fuller, 1910]. The St George (foreground left with flags) with other vessels. Sonder Nissum Church, Sonder Nissum (also here), Denmark (see map and street view). This church has a memorial stone to the lost of the St George and the Defence.